For a long time, I didn’t know that pomegranates were edible. I thought they were for decoration. My mom used to have a jar filled with little dried pomegranates underneath the coffee table in the living room and when I was little, I liked to empty them out onto the carpet and shake them to hear the seeds inside. Many years later, when I was in college, a friend of mine mentioned eating pomegranates. Eventually I tried pomegranates for myself and I came to love them, even though they’re a complete pain to prepare. My husband doesn’t think it’s worth the effort, but I do–I get excited about pomegranate season and I always feel bummed when it’s over and I know I’m going to have to wait until next fall to have them again. 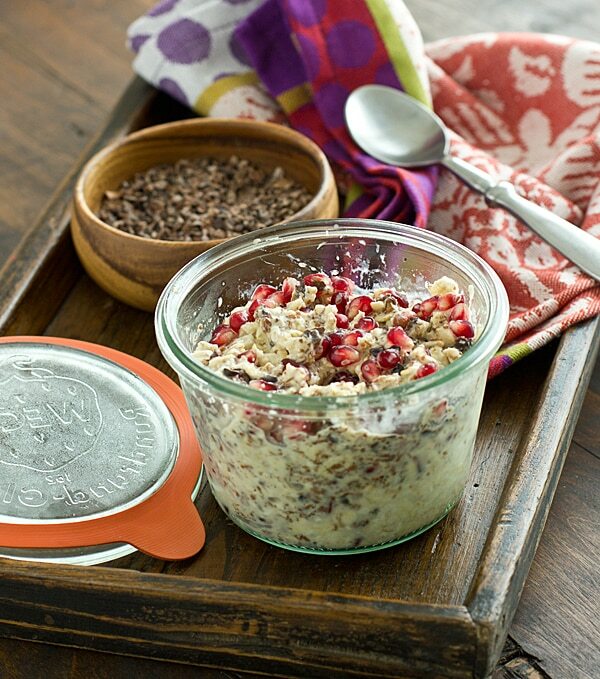 With pomegranates in season now, I thought I’d try adding them to my overnight oats for breakfast. Lately when I make overnight oats, I’ve been using an equal amount of fruit and oats. It helps me feel like I’ve eaten more–because let’s face it, 1/2 cup of oats is nothing. Nothing! So I added 1/2 cup of pomegranate seeds to the oats and almond milk. And then I added chocolate. My first attempt at chocolate overnight oats was kind of icky–I realized that I don’t like cocoa powder in my oats. It’s a little too much first thing in the morning. So instead, I used cocoa nibs. They give the oats a chocolatey flavor without adding too much chocolatey flavor. Like any overnight oatmeal recipe, there’s a lot of room for adaptation. Use your favorite kind of milk! Add chia seeds or chopped nuts instead of flax meal! Put in protein powder if you insist! Whatever. It’s all good and it’s pretty much impossible to mess up. 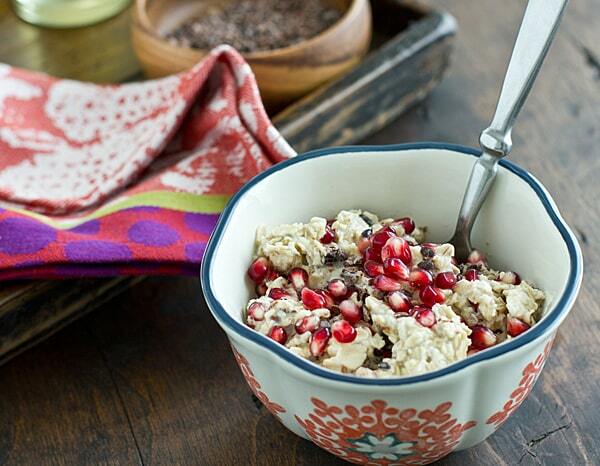 This Cocoa Nib & Pomegranate Overnight Oats recipe is an easy, healthy way to start the day. Stir together ingredients in a resealable container. Cover and refrigerate overnight. Stir again before serving; add additional milk for a thinner consistency. If you use unsweetened milk, you may want to add your sweetener of choice to taste. What a very Fall lookin’ bowl you have there! Yes! I’m a huge pomegranate fan and I can totally see how it’d work wonderfully with chocolate. Looks lovely! Ooh, that sounds good. I noticed my Publix has tubs of pomegranate seeds available in the produce department so you don’t have to spend all that time getting them out. The first time I ever bought a pomegranate, I don’t want to admit how long it took me to get all the seeds out and it made such a mess! When I have a big pomegranate, I swear sometimes it takes me 45 minutes to get all the seeds out. And I do it underwater, so my fingers get all prune-y too. I not only like eating nibs, I like saying NIBS! 😉 What a happy bowl of oats. I was half asleep when I wrote this post and I kept typing “nubs.” Which is also fun to say, but not nearly as appetizing. This is probably a dumb question, but can you make overnight oats with steel cut oats? They are so hard, I wonder whether they would soften overnight in the milk. I’ve tried it myself, but they’re still too tough for me–I’m not a fan. But other people seem to really like them, so it’s worth a try! Wow, thanks. I’m going to try it. I LOVE them really chewy and texture-y! I have a mother / pomegranate history too. My mother banned eating them in the living room. Too messy with the seeds that stained the rug. Yeah, I spilled a bunch of seeds all over myself last year–that is one stain that never comes out! Did I get it right – you eat oats without cooking them? I’ve never tried them like this. I guess they are healthier this way, aren’t they? Nope, you don’t need to cook them because they get soft when they sit overnight. It’s so easy to do and I actually prefer my oats cold now! The overnight oats looks lovely. You come up with the most interesting and delicious ways to have oatmeal. Looks delicious! I’ve never tried cocoa nibs in oatmeal – what a fun idea, and I just love how pretty pomegranate looks in this breakfast bowl. It took me a while to get up the courage to eat pomegranates but now I ♥ them. They’re good to flush parasites too. Ha! Sorry! Kinda gross but a fact. When I ate oatmeal, soaking it was the trick to turn it from ordinary to HEAVEN. I’ll have to try this with chia seeds. I try to switch things up every few weeks–I get bored really easily! 🙂 I made them with peaches and berries a lot over the summer, so it’s nice to have different fruits to play around with now that it’s fall. I think I’m the last person who hasn’t tried overnight oats! This looks like the perfect start. I didn’t try them until recently because I was convinced that cold oatmeal would be disgusting. But it’s really not! 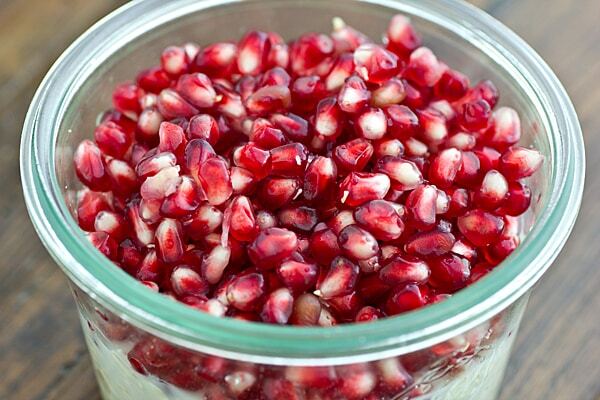 I love snacking on pomegranate seeds but hate getting all the seeds out – not that it’s hard but I always end up ruining my shirt or getting the juice everywhere! I’m always so tempted to buy those plastic containers of the prepared seeds but they’re so much more expensive! I bought those once and when I went to eat them the next day, they were moldy. Not just a little bit moldy, but completely covered in white fuzz. After a day! I’m sure it was just a fluke, but now I’m scared to buy them again. 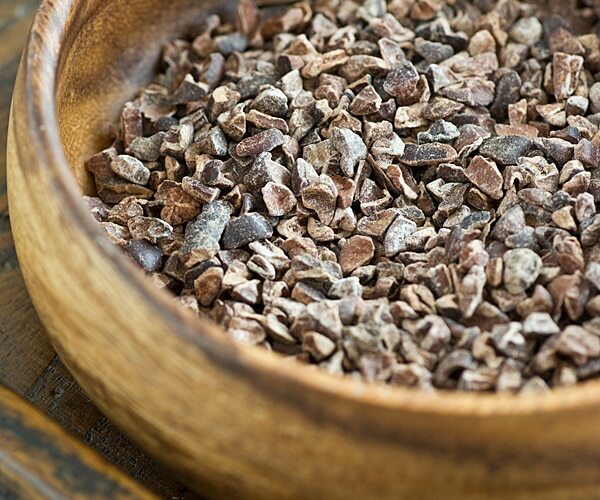 Love those cocoa nibs! I’m passing this one to my mom, she’s a big oatmeal person. I can’t wait to try this! I just learned a few months ago that buying them from the bulk bins was only half the process and I needed to grind them. What do you use to grind your flaxseeds or do you buy them already ground? I buy them ground. I tried doing it in the food processor once and it didn’t work, but I think it was because I was trying to do a small amount–maybe a few cups at a time would be better? No, they are the worst, really. There is absolutely nothing relaxing about standing hunched over a bowl of water and pomegranate seeds, juice spattered all over your shirt, back hurting, prune-y fingers–nope, not relaxing! The prettiest overnight oats ever! 🙂 Love the colour of pom seeds. Looks delicious. Love the addition of cocoa nibs! 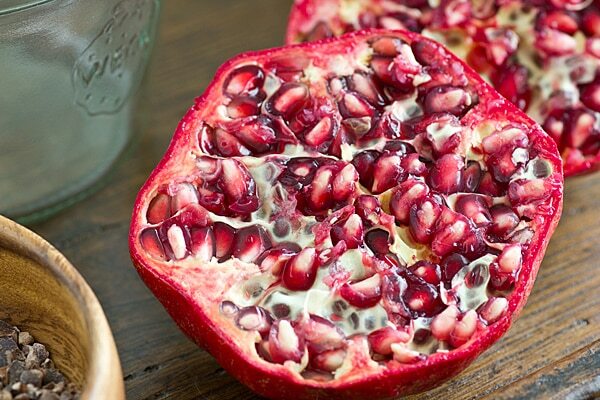 Pomegranates look like pods filled with rubies. but they are better than rubies. you can eat them! and they are amazing! i’m surprised by the addition of cocoa nibs, but it’s a pleasant surprise. love it! They are so good, right? Definitely one of my favorite fall snacks! I’ve got to get back into the winter routine of oatmeal done overnight in the rice cooker. I like steel cut oats cooked with the porridge setting of the rice cooker. Coincidentally, I just bought my first package of cocoa nibs and love them! Thanks for the idea of putting them in oatmeal! I love pomegranates, too, I got a tray of six jumbo ones at Costco that I’m still working through. I’ll keep that pomegranate/cocoa nib combination in mind.